Here is our carnivore/vegan blended menu plan for our family for this week. Some of these items got bumped to this week from last week when plans changed. 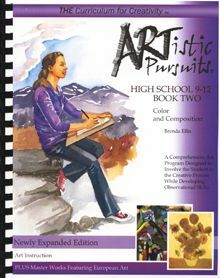 At the end of February I was delighted to learn that I had been selected to review High School 9-12, Book 2: Color and Composition published by ARTistic Pursuits. 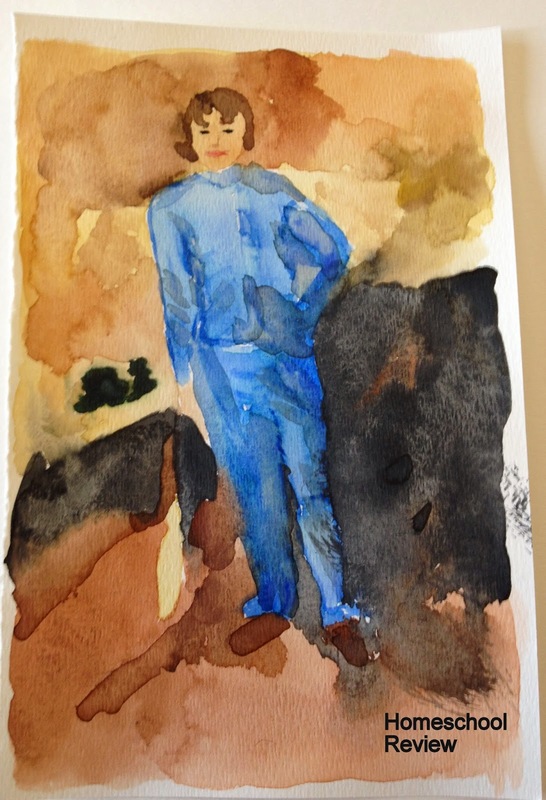 Many years ago my oldest took a course in water color painting outside the home, and I first became that there was a whole lot about water color painting that I did not know, and I did not know of any way to acquire the knowledge to be able to instruct my son in this form of art. 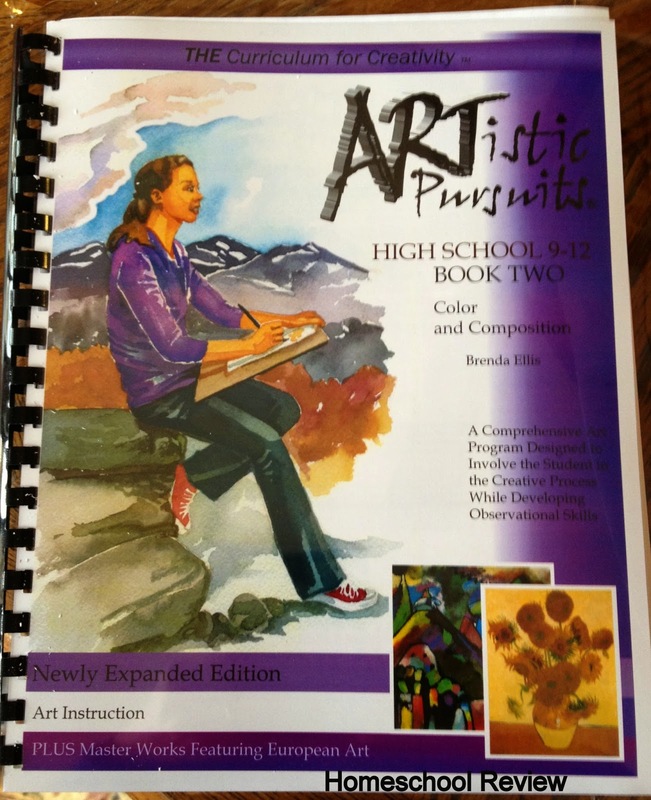 So I was so pleased when I learned that we would get to review High School 9-12, Book 2: Color and Composition. What do you know! I had everything already! We were running out of tape, so we bought some of that. So we waited for the book to arrive. We stalked the mailman! Finally, one day the package arrived. It's always so exciting when new materials arrive in the mail! I was so certain we would get started with what was left of our week that the package arrived, but as it turned out I used that week to read through sections of the book to familiarize myself with it. 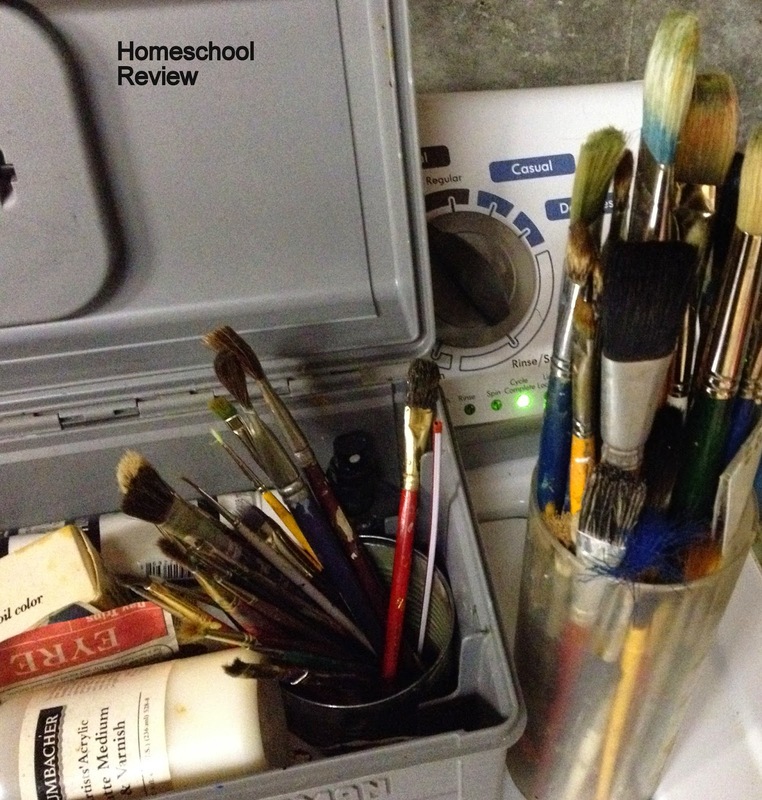 I also looked at my paintbrushes to decide which ones we would use. Monday arrived, and we read through Unit 1, Lesson 1. Unit 1 is about Hue, which is another name for color. The assignment for the day,for Lesson 1 was: TRY THIS: Collect ten samples of plant material such as leaves, grasses, petals, seedpods, or vegetable greens. Bring the into a sunlit room and examine the shapes. 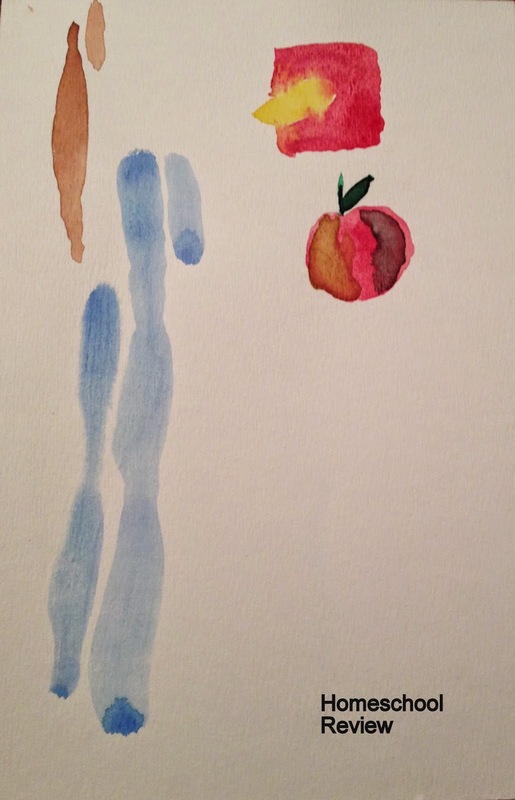 Then paint each shape using one of the hues in your watercolor palette. Did I mention what a winter we had this year? 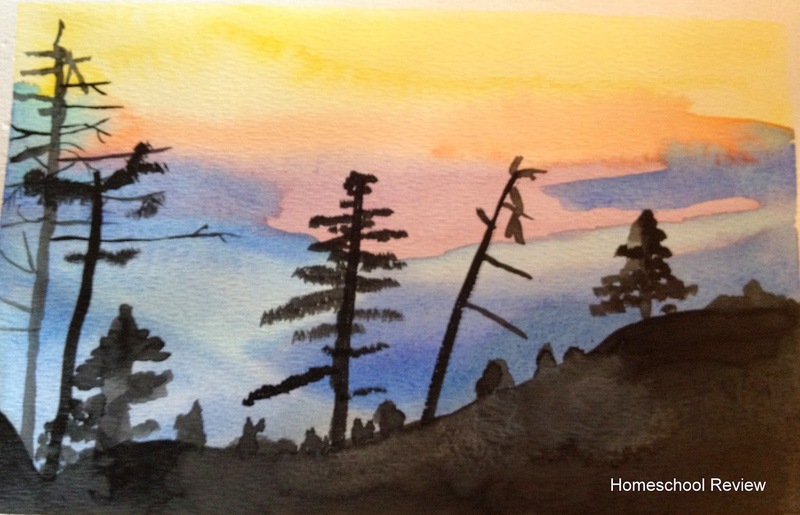 We read through the entire lesson but did not end up painting anything, figuring we'd try again when we could find signs of life in the spring.The goal of the first assignment was to have us observe hue intensity and variation in colors. In the second lesson we worked with primary colors to make secondary colors. 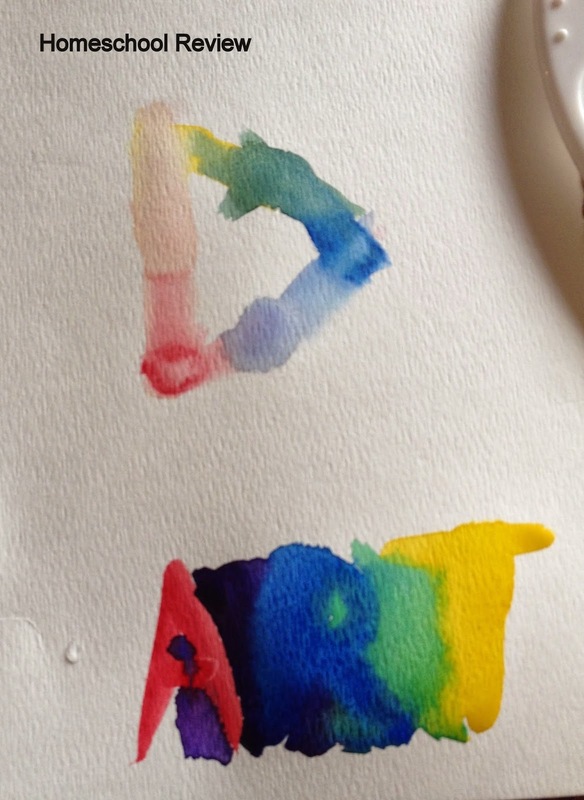 My son demonstrated this by painting "A" (red) "R" (blue) "T" (yellow) with the secondary colors between the primary colors (but he missed orange, which would have blended A and T). 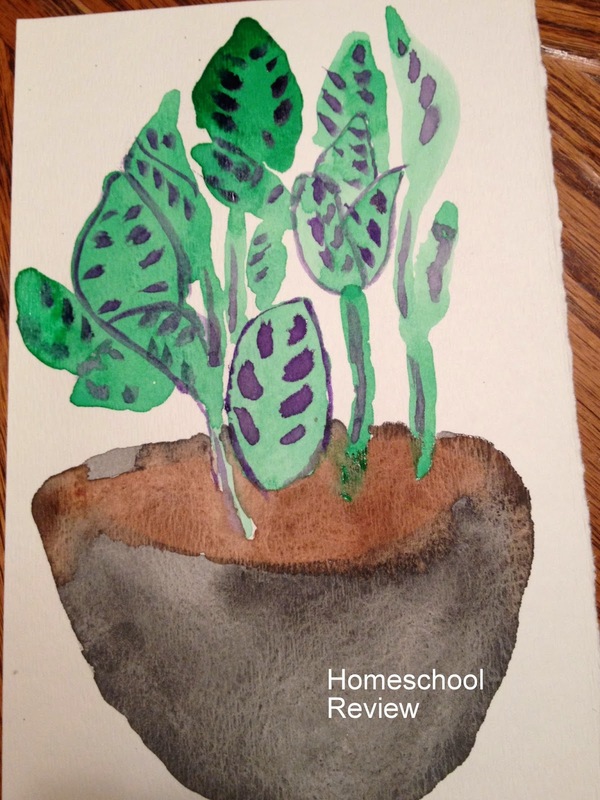 Lesson 3 had us experiment with round and flat brushes, wide and thin strokes, and talked about not expecting a light watercolor paint to show over a dark watercolor section. The 4th lesson asked us to paint a group of leaves, placing them directly in front of us, mixing colors as needed to get different shades and hues. 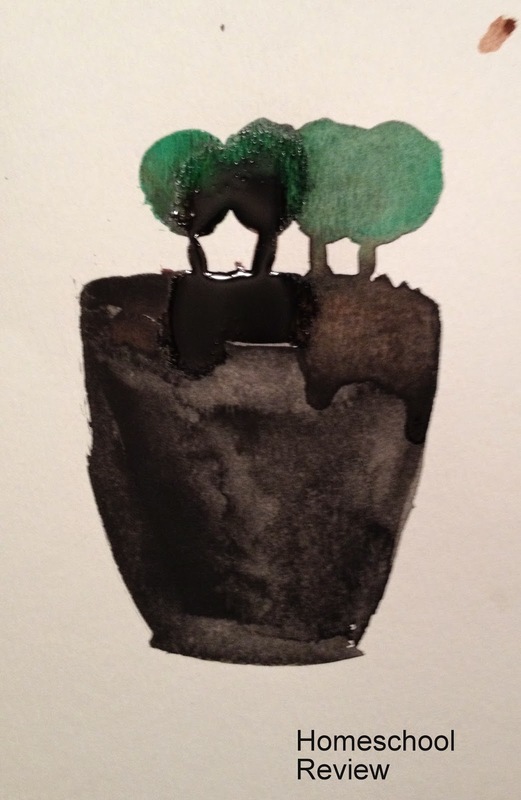 The book shows using a potted plant, so that's what we did. In case you're wondering, Mom painted along on this review, too. Mom wanted to review this product more than the student, and during this review, while his level of effort seemed to ebb and flow, his level of interest seemed to remain low. He also asked me not to put photos of him on my blog, so photos of our work is the best this gets. Unit 2 is about Tinting Hues, which changes the value of a hue making it lighter or darker. The assignment for Lesson 1 was to paint using lines of color to describe the edge of the subject you are painting. 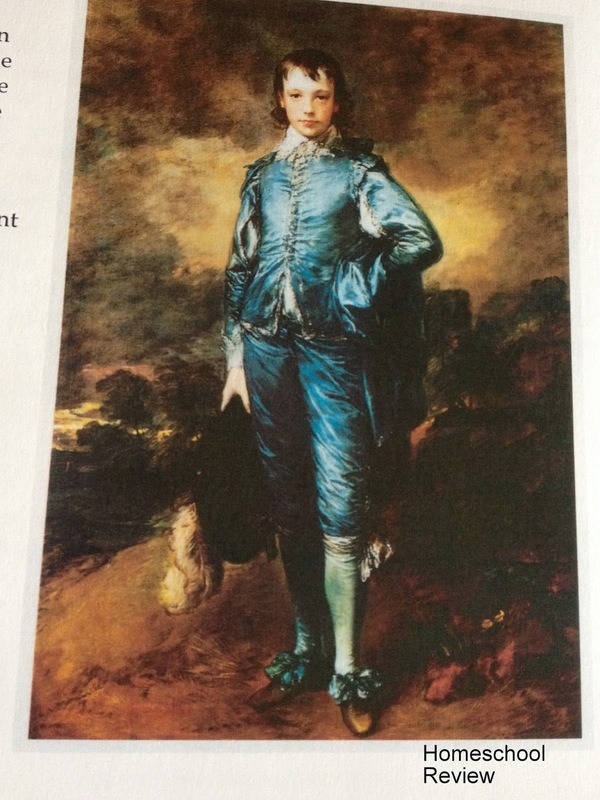 The suggested subject was The Blue Boy by Thomas Gainsborough. After a lot of time and work, a paintbrush with brown was supposed to deliver some hair to the picture, but too much paint, too much water, I don't know... But I thought this painting was going to end up headless and abandoned. But another day, and an opportunity for things to dry, and the picture was actually very forgiving after all. So on The Blue Boy lesson I really experienced the conflict between using this curriculum to its fullest vs. completing as many assignments as possible for you, my reader. 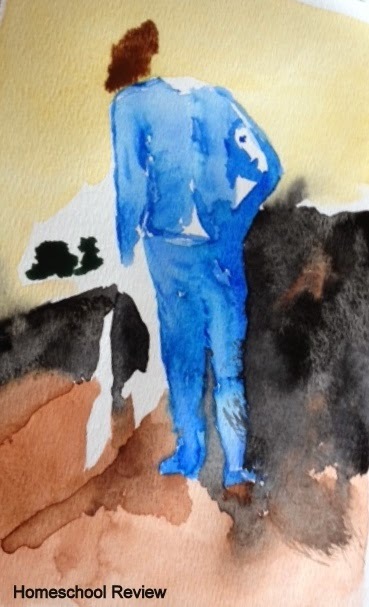 The curriculum wanted the painter to park on The Blue Boy for awhile and paint it several times, experimenting with hue and value and shading. For the benefit of covering more material for the review we just moved on. 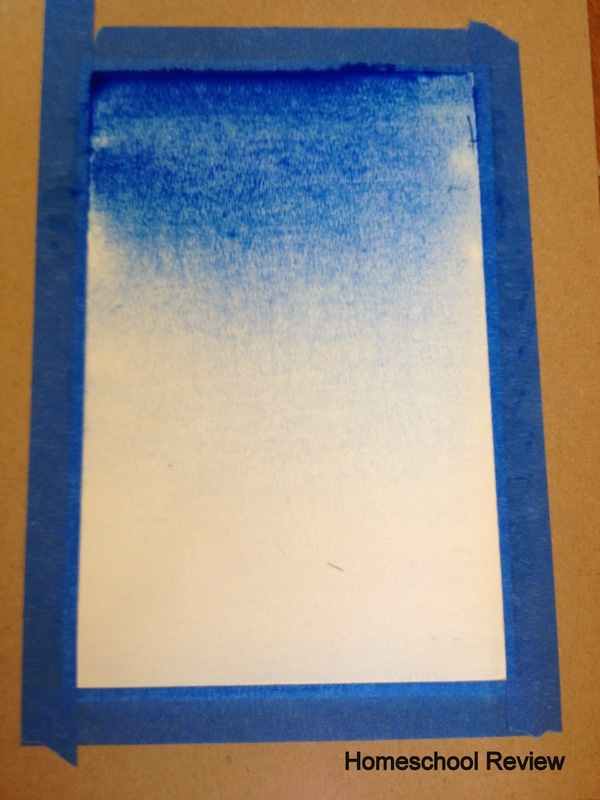 The next section taught about wet washing the paper as a technique for water color painting. 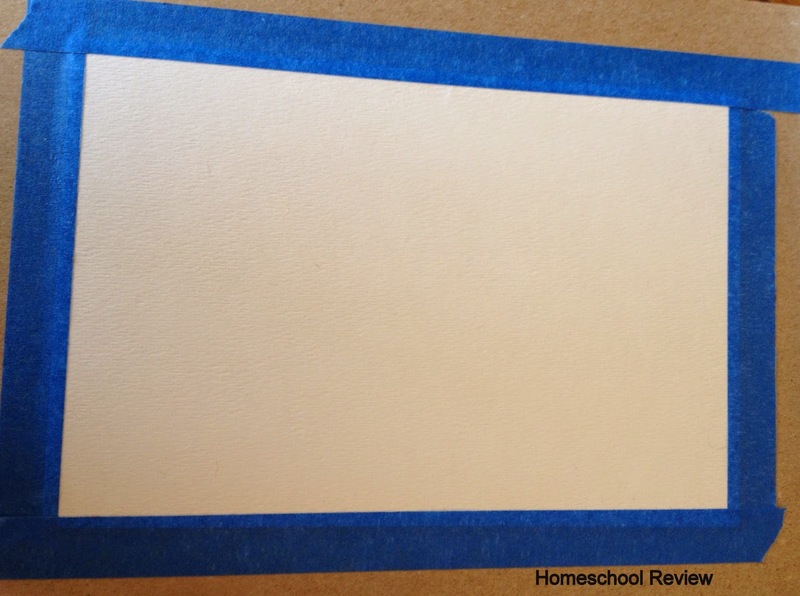 So starting with paper taped to a work board, you wet the paper down with clean water using a mop brush. Once wet, you add color, painting across the top with the darkest color and allowing the color to be less and less the further down the page you go. 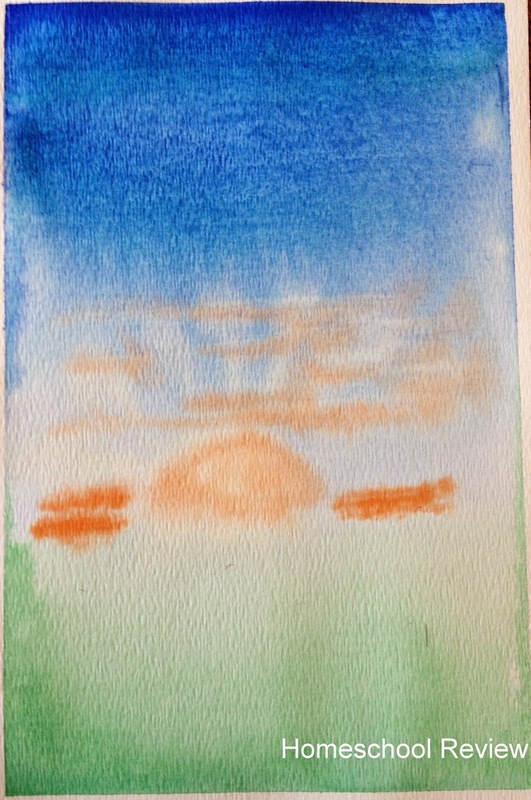 This was just an exercise for learning, but just for fun it got turned into a sunrise. 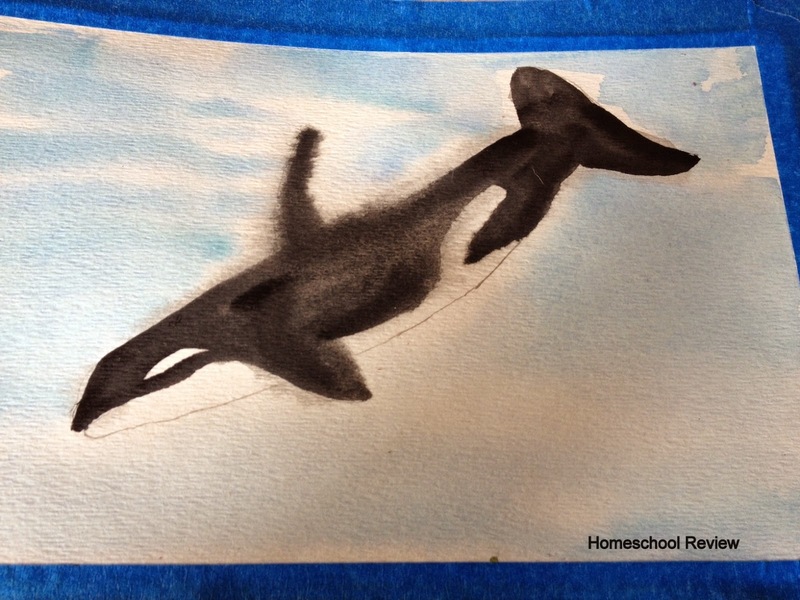 The next wet wash assignment was to sketch an animal in pencil, wet wash the paper, and then paint in one color experimenting with gradations of color and wet washes. The painting shows that the water did not distribute evenly, causing a more washed out section in the center. It could be fixed with drying and working it again, but we moved on. Did I post it sideways? Maybe. I have no clue. The next assignment calls for painting a fruit in good lighting, focusing on conveying the shading that is caused by light and shadow. The next assignment teaches a method for transferring a drawing to watercolor paint and then painting in the drawing. 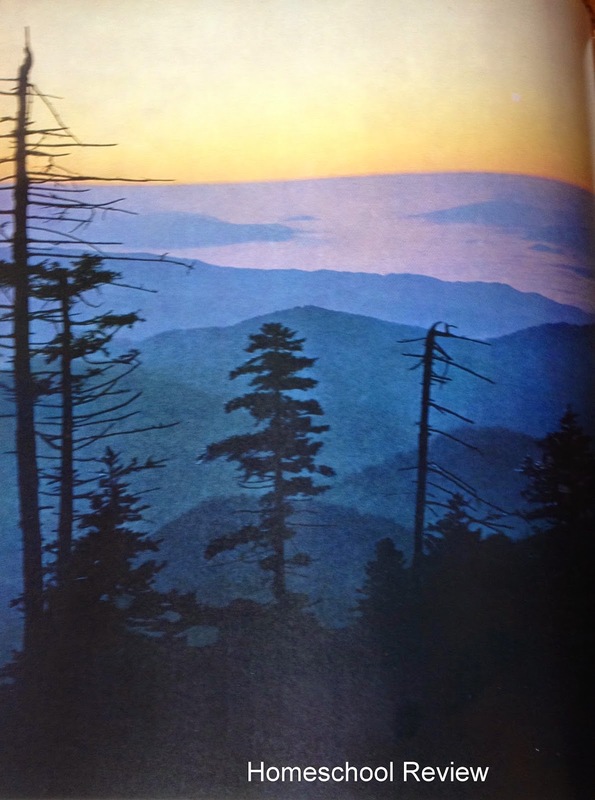 The next assignment begins with transferring a photograph to water color paper, using the previously taught method, and painting the picture. I wish I could have gotten through more projects for you during my review time, but it is a difficult thing to balance getting lots done against spending as much time as needed on each project to do the painting well. So I flipped ahead to see some more of the upcoming projects. 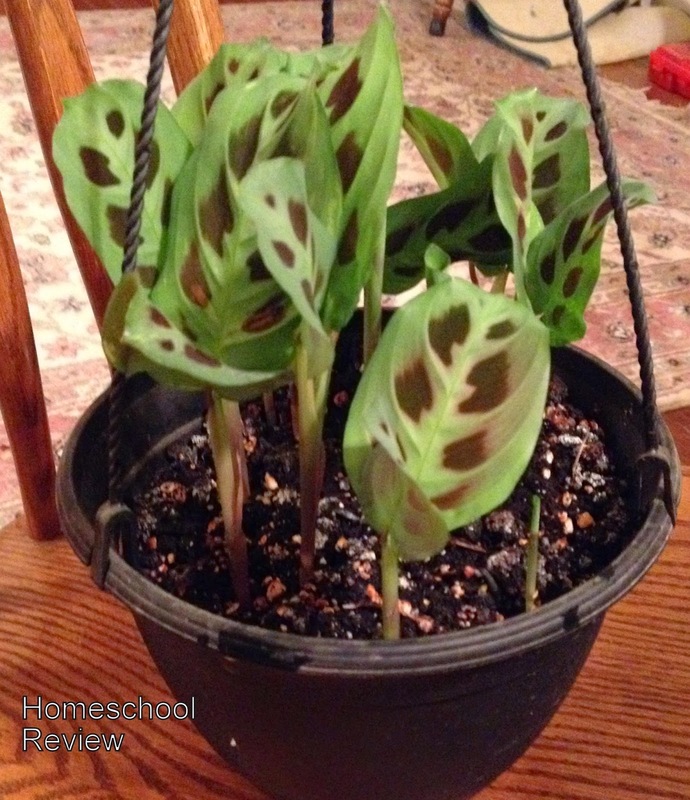 Hopefully I can get some more project photos added to this blog entry as we get more lessons. I hope you have enjoyed seeing the artwork my son and I produced while working in Color and Composition during our review period. My son still doesn't like to paint, but at least he tried and at least he has learned a few new techniques. I have really enjoyed High School: Color and Composition. I can't wait to get to more of the book. My son... doesn't like painting, but he is being a good sport. 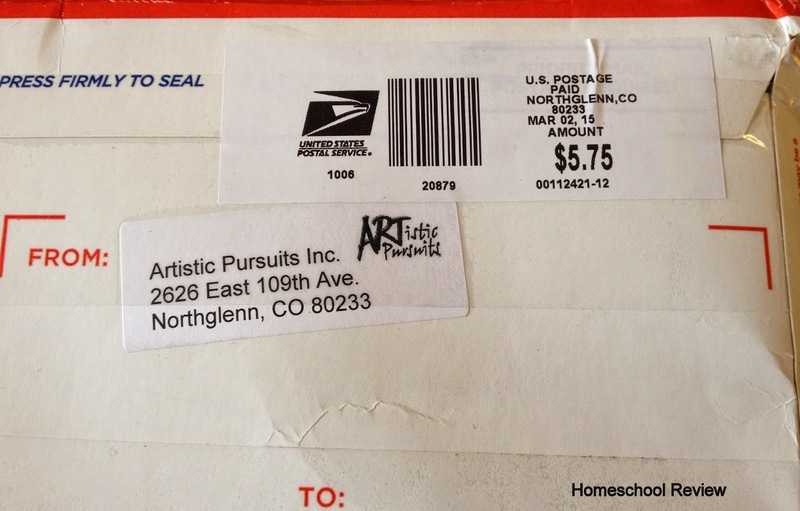 The art books by ARTistic Pursuits are all excellent and a very good value. 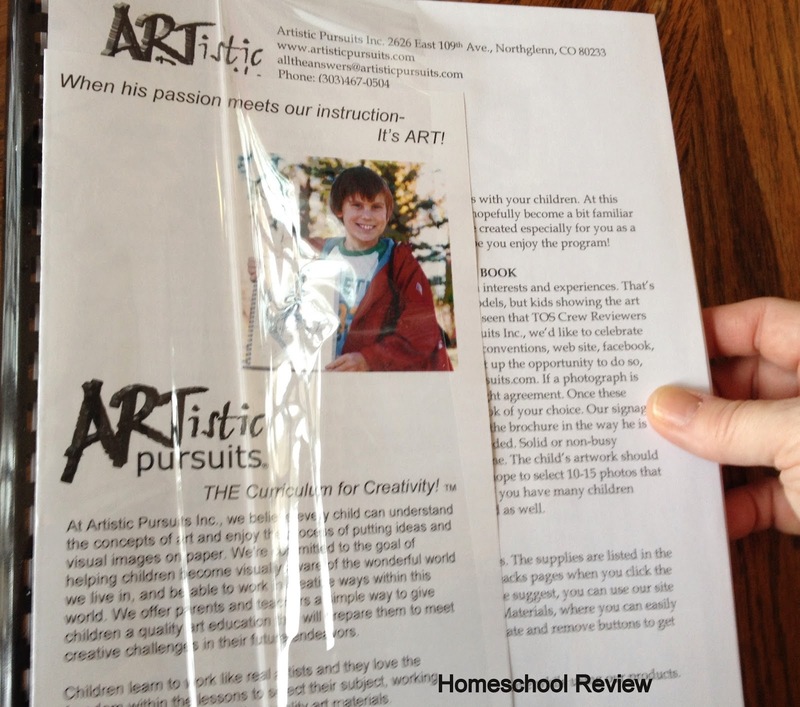 Read more ARTistic Pursuits reviews by clicking the button below.